Limity jsme my urban mobilisation action to raise awareness regarding coal mining and burning, thus educating the townspeople and rallying up more support. 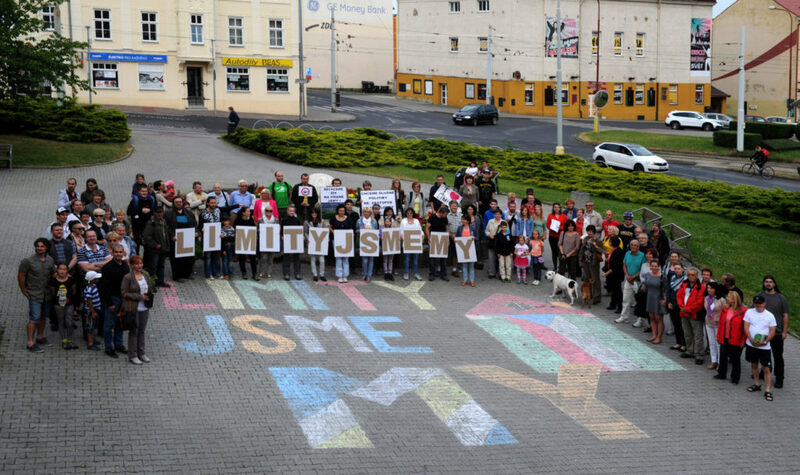 Limity jsme my are an open grassroots civic movement against coal mining and coal burning. They bring together individuals from both activist and non-activist groups around the Czech republic. Their origin story goes back to 2015, in the wake of a governmental proposal to break the brown coal mining limits in Northern Bohemia. This would mean, in its worst form, complete demolition of the towns of Horní Jiřetín and Černice. 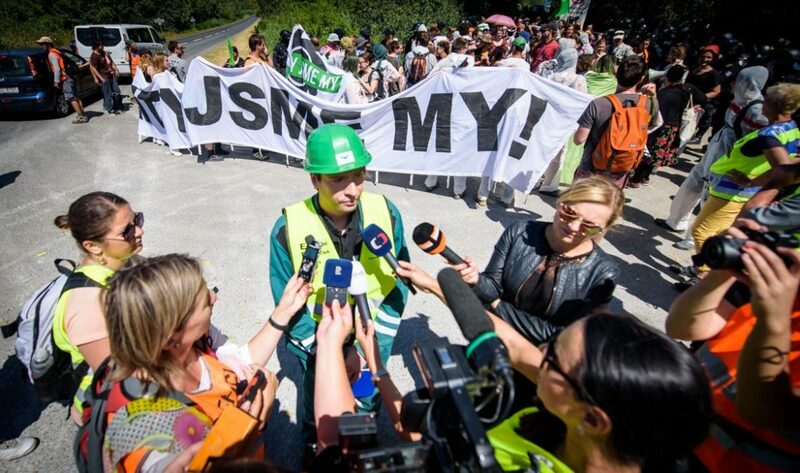 During the 2015 campaign for keeping the mining limits, they organised together with thousands of people around the country and stood against breaking the coal mining limits in the Bílina mine and ČSA in Northern Bohemia. This will involve shifting the narrative & effective framing of the problem in terms of a climate emergency connecting to environmental & quality of life problems, within the community to successfully undermine the industry’s social license to operate. Limity jsme my consist of a core group of approximately 25 active volunteers. They meet approximately once a month on weekend plenums where they discuss progress of initiatives and make decisions. They have established several working groups (mobilisation, communication, logistics, fundraising etc.) that meet via weekly teleconferences or in person and execute plans. Their process group is responsible for overall coordination and preparation of plenums. 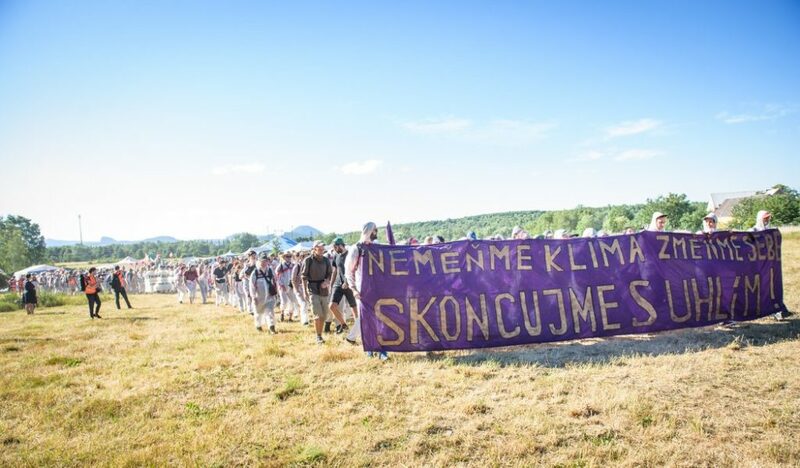 Even though Limity jsme my want to continue running the organisation on a voluntary basis, they feel that climate camp organisation is extremely demanding and they agreed to hire paid coordinators for last two crucial months. This is where the Guerrilla Foundation funding comes in. The grant will go toward equipping the camp, producing renewable electricity, recycling all the trash & payment of the coordinators who will make sure that event runs smoothly and is populated with activists. 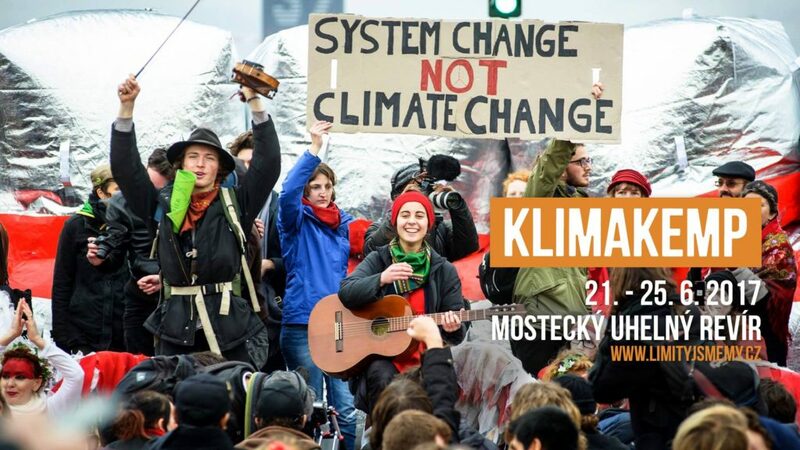 Klimakemp will be the first international Climate Camp in the Czech republic. This five-day event will take place in the North Bohemian mining region from the 21st until the 25th of June 2017. They will connect, inspire and empower people to become active in climate protection and join us in reaching our goals. Limity jsme my will offer discussions, workshops, trainings and other means of educational and networking opportunities. The camp will be run in a sustainable manner (renewable energy, no meat, recycling etc). They’ve already started public awareness campaign (public screening tour throughout the country, speeches and debates, beneficial concerts and exhibitions, social-media communication) that will lay the groundwork prior to the Climate Camp. 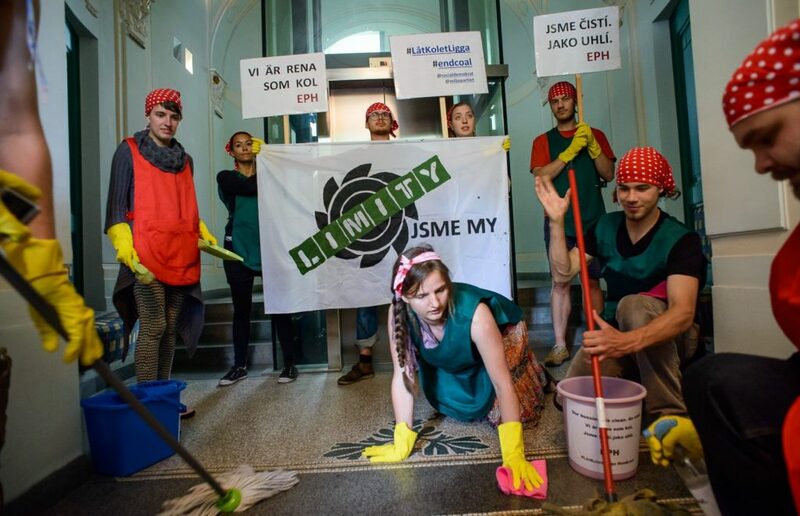 – encourage the locals in their project of making the town of Horní Jiřetín fossil free. Until 2017 they have run all their activities without any operational budget, relying on the material support of larger affiliated NGOs, such as Greenpeace or Friends of the Earth, when needed. But as they have decided to broaden activities with Klimakemp they had to set up a legal entity to be able to fundraise & also to participate in administrative processes connected with mining officials. Therefore as of January 2017, Limity jsme my is a registered civic association. They are also being funded and supported by Rosa Luxemburg Stiftung, XminY Foundation, Friends of the Earth CZ and DEAR (Development Education Awareness Rising EU programme). The continuing mining and coal burning is not only a threat to people’s homes and health in Northern Bohemia at the moment. They are also one of the prevailing causes of the global climate change. 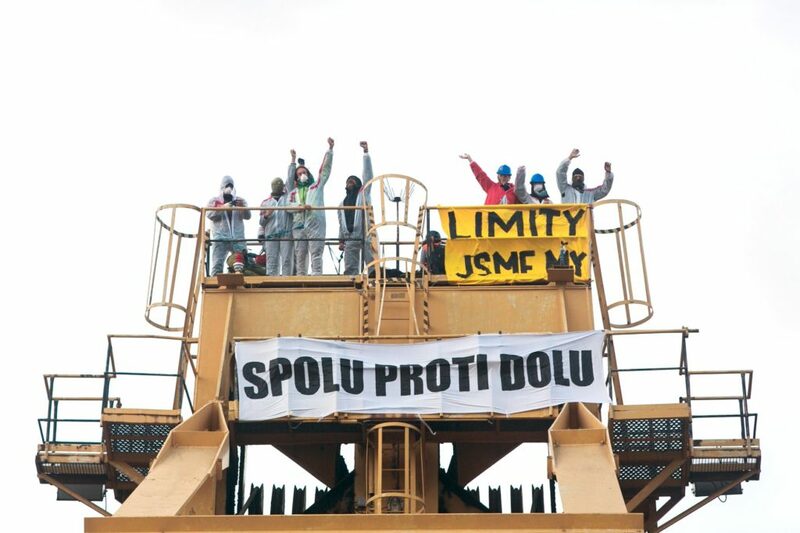 The urgency of the climate change is serious to such extent that it is impossible to be satisfied with the limits leading to end the coal mining in the Czech republic as far as 2055. This is why the movement Limity jsme my joins the global struggle for a responsible solution for climate justice and the future without reliance on fossil fuels. They will employ pressure for an immediate cessation of coal mining in the Czech republic and push for a transformation to renewable energy sources. Limity jsme my focuses on Systems Change and root causes of Climate Change not just the symptoms which they also rally against but not in isolation. Following a successful Climate Camp last year, Limity jsme my approached us for a 2.0 version in 2018. They primarily needed funding for the camp’s infrastructure, making sure it is hygienic and as environmentally conscious as possible, as well as for curation of an inspiring programme for the duration of the camp. They see the Climate Camps as part of a longer term strategy aimed at creating the pressure needed to bring about the phase out of coal. From last year’s experience, the team expects more people to be involved and supporting the movement, as well as their message becoming more mainstream. 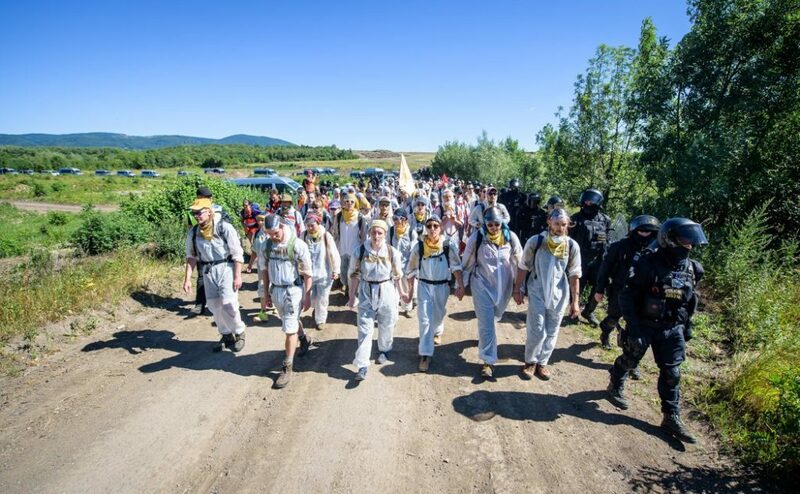 They want to build on the success of the first “Klimakemp” with an even better five-day event, taking place in one of the coal-impacted regions from 27th of June to the 1st of July 2018. The climate camp is a non-hierarchical area filled with program consisting of workshops, debates, assemblies and other activities. The main part of the programme is curated but at the same time people were encouraged to set up their own workshops. The crew created a space for the whole of wider social-ecological movement to learn and share experiences from their struggles, make new connections, experience sustainable ways of living and participate in an inclusive space. It was also great chance to strengthen their connection to an international movement. They put more attention into the visual & storytelling aspect of the Climate Camp this year. Having already organised a meeting for international artists in the mining region in collaboration with experienced curators. They also created an Art Space at camp as a place where people can produce their own banners or creative tools, but also discuss the role of art in society and its connections to activism. There were almost 300 participants in 2017. This year 500 attendees are expected.